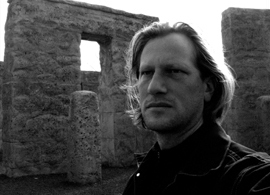 Daniel Menche is a US musician/sound artist who has worked primarily in the ‘somatic’ area of noise music, using natural sounds recorded from the human body and the open air, along with broken audio machinery. Known for creating towering plumes of densely droning layers, Menche sees himself as a sound sculptor working with the opposing forces of order and chaos. He carefully structures sound with unfolding narratives in a determined quest for ‘vehement beauty’ that results in a crossbreeding of noise and ambient music. Using mostly low-tech electronics, Menche has been performing live and releasing music prolifically since 1993. The Portland-based artist presents live shows that may be characterized as both extremely loud and delicately subtle. Menche often compares his work to storytelling, concentrating on purposeful sound arrangement, with beginnings, middles and ends, each contributing in a specific way to the mood of the piece. He eschews classification as a noise artist, though many of his techniques suggest similarities to musicians who work within that realm. Menche avoids the use of synthesizers and other complex technologies, often relying on contact mics instead. Menche also developed a reputation for using his own body as a sound source early on in his career, manipulating contact mics on his skin to produce sound. He often uses field recordings in his compositions too, though most sources become unrecognizable after thorough processing. Menche’s first album Incineration, released on Soleilmoon in 1993, attracted attention for its aggressive explorations of processed bodily noises. Follow up albums were produced in a similar vein, but after Vent (Or, 1998), Menche began to sculpt a kind of noise that was subliminal, atmospheric and ambient. The EP Crawling Towards The Sun (Soleilmoon, 2000), October’s Larynx (Alluvial, 2001), exemplified this new approach, as did the dense textures of The Face Of Vehemence (Ground Fault, 2002), the organic structures of Beautiful Blood (Alien8, 2003) and others that followed. Menche turned another 180 degrees in 2006, with the double-CD Concussions. In a totally new approach, the album was devoted to percussion instruments. Menche explored extremes of percussion by recording the pummeling of tom-toms and bass drums, then altering the speed of each track in the mix, electronically speeding up and slowing down the rhythms. The Concussion project has been compared to Steve Reich’s Drumming. 2006 was also a year that Menche’s music took on a more gothic aesthetic, Radiant Blood (Drone, 2006), a 10″ record of slow drone, is a good example, as is Creatures of Cadence (2006). Menche released a collaboration with Kevin Drumm, Gauntlet, on Editions Mego in 2007, which was generally well received.Menche performs live extensively throughout North America, Europe and Japan. He has released music on labels such as Trente Oiseaux, Or Records, Alien8, Antifrost, Tesco Organisation, Blossoming Noise and Beta-lactam Ring Records. He made one album under the alias Johnny Pinkhouse called Bad Acetate that was released on Soleilmoon Recordings in 1999.